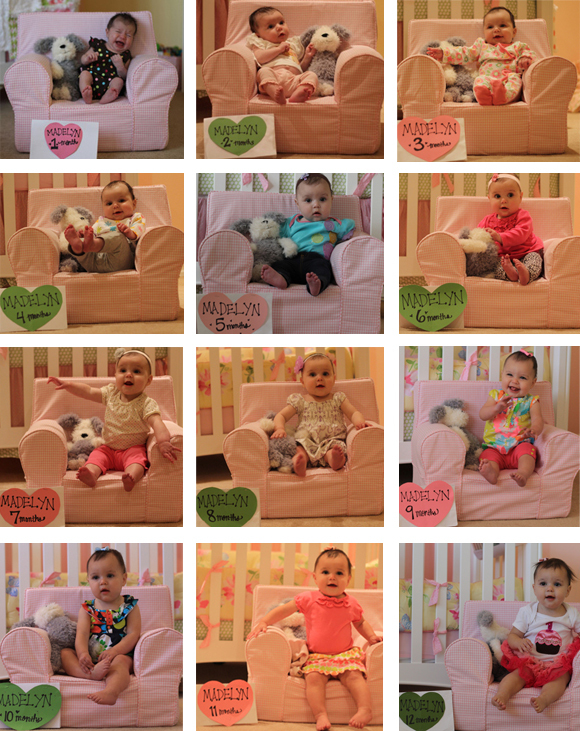 Born Friedman » Twelve months! ONE YEAR! Hi. My name is Alison. I am a mother to a ONE-YEAR-OLD! 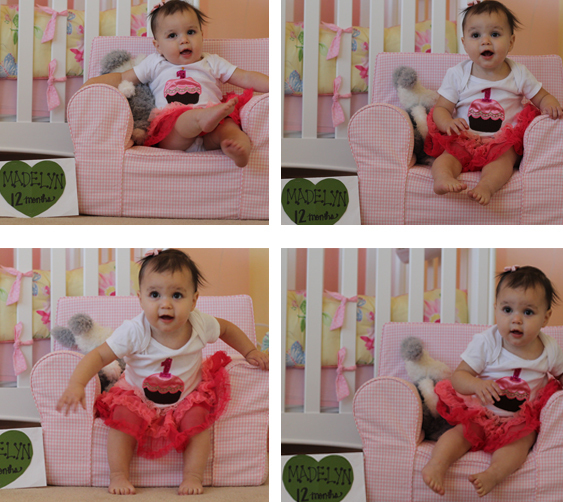 Holy 12 months, where did the year go? Madelyn is officially out of infancy and our toddlerhood begins. She is definitely toddling, though not on a regular basis. She’s taken steps and is still building her confidence, so crawling is still her preferred method of transportation. 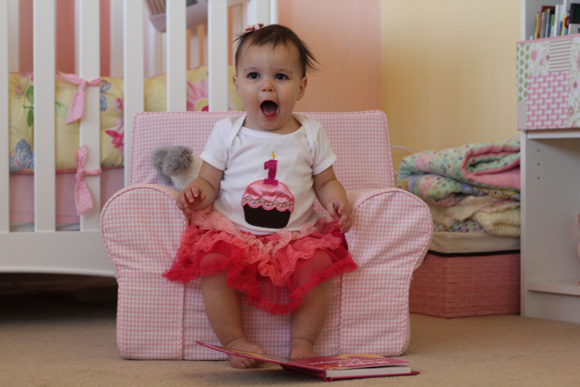 It’s no secret that I’d been pretty emotional about her turning one. I still can’t really articulate why, but the feelings of nostalgia were in full force, pulsing lots of awe and amazement for what we’ve all experienced in the past year. The night before her birthday, I rocked her in her dark room as we always do when she takes her bedtime bottle. I played with her hair and stared at her lips and eyes as she calmed herself for sleepy time. The diva that she is pushed the bottle as if to say “take it away, Jeeves! I just simply canNOT be bothered with it anymore!”, wiped her eyes, and scrunched her face in her poodle lovey. She does this every time she is finished with her milk and ready for her crib. So I stood up with her, gave her a kiss on the forehead, and slowly lowered her into her crib, whispering to her, “Goodnight my little 11-month-old for the last time. When you wake up in the morning, you’ll be one.” She turned over, stuck her tushie up in the air, and drifted off to Dreamland in no time. I, on the other hand, ran out the door and into Bryan’s shoulder where I sobbed that I just put to bed our little baby and when I go to her in the morning, she won’t be a little baby anymore. And I guess that’s what got to me. That time moves on. Ready or not. She’s ready. And I will be ready. I will. Took her first steps! It was very random and totally sans prompting from us. She just… did it. There is absolutely no consistency to this so-called walking and I wouldn’t even say she’s walking. More like, well, she HAS walked. But she improves each time she does it. We have to place her, balance her, and then she’ll put one foot in front of the other, which, if performed in sequence, I guess equals walking. I think she’ll be doing it on her own soon, but there’s still a ways to go. Still, it’s pretty exciting. I think I’m ready for her to be a little more independent and so I can be a little more hands free! A walking child is like baby bluetooth. Continued to eat anything and everything. This child has not shown any kind of disgust over certain foods and will pretty much eat all food we give her. I’ve never seen a small person eat so much broccoli. And enjoy it. However, she is not the neatest eater so her brother Princeton likes to hang out under her high chair and wait. He inevitably gets fed and Madelyn thinks it’s hilarious. She’s begun to deliberately feed him taking a bite of her own, then handing off a bite to P. She alternates this practice and I glow with joy and pride over the sharing that’s going on between siblings. If only he’d remember her kindness when she reaches for his tail. Danced and clapped while pushing her new walker! 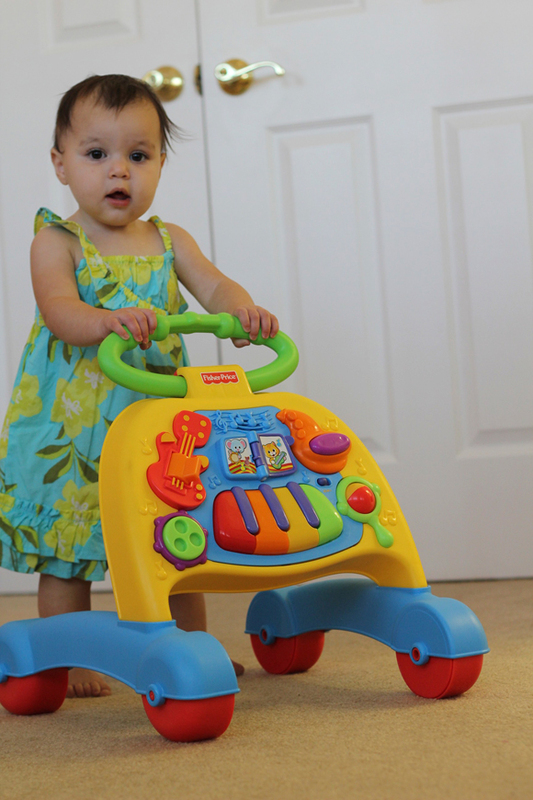 The walker is adorable and plays cute songs when it moves, so she’ll push, hear music, and bounce-and-clap. Then the song will run out so she’ll push, hear music, and bounce-and-clap. She’s like a sorority girl during rush. And she really has great rhythm! The walker plays a Japanese-synth-style “Rockin’ Robin” and she goes nuts like a 1960s teenager over Paul McCartney. I think her new walker is also helping give her confidence to get more comfortable with independent walking. I just hope when she starts walking for real, she claps and bounces then, too. The happy girl should have a little pep in her step, right? You GUYS! I’m ONE! My curfew is, like, 7 p.m. now! Whoooaaaa… I think I celebrated and drank too much milk! I really need to lay off the bottle!! Wheee! Girls just wanna have fuuu-uuu-uuun!!! 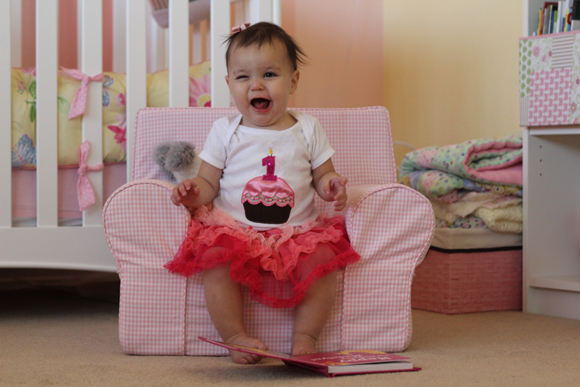 Happy First Birthday, Madelyn! And I hope to share many many many more birthdays and firsts with you. This year has been fun & flown by, but we have more fun experiences to conquer! I Loooove you!